Celadons of the Koryo period are among the most celebrated works of Korean art. In this piece the combination of the naturalistically inspired lotus petal form with the abstract qualities of the glaze and texture have produced an object of the highest artistry and sophistication. 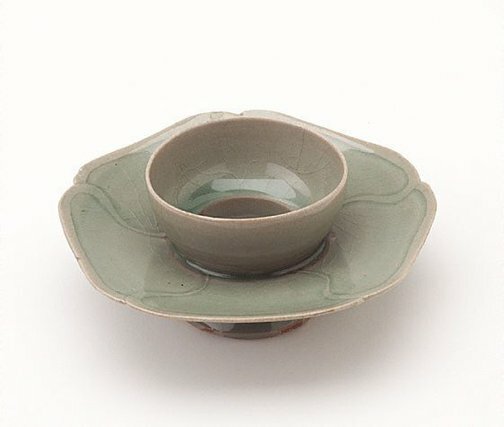 Like the majority of the Koryo celadon repertoire, the cup stand derives from Song dynasty Chinese prototypes: wares distinguished by their simple and refined forms and the exquisite lustre of their glazes. The unusual shape of this cup stand harks back to the silver and lacquer types of Tang dynasty China (eighth century), which combined the offering cup and separate stand into a single unit. The ceramic version was refined in the Song dynasty, most especially by potters at the rarefied imperial Ru ware kilns in Henan province. Jackie Menzies, Asian Collection Handbook, Art Gallery of New South Wales , 'Introduction', pg. 9-17, Sydney, 1990, 10 (colour illus.). Jackie Menzies, AGNSW Collections , 'Asian Art - India, South-East Asia, China, Tibet, Korea, Japan', pg. 173-228, Sydney, 1994, 210 (colour illus.). The Asian Collections Art Gallery of New South Wales , Sydney, 2003, 185 (colour illus. ).